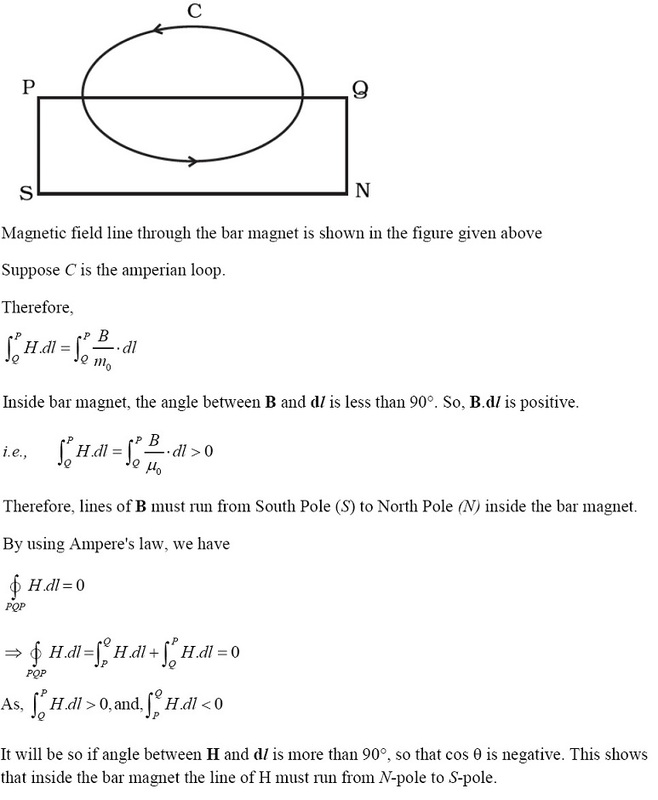 Get Class 12 Physics NCERT Exemplar Solutions for Chapter 5: Magnetism and Matter. Here, you will get solutions to short answer type questions i.e., question number 5.16 to question number 5.20. These questions are important for CBSE Class 12 Physics board exam & other competitive exams like NEET, JEE Main etc. NCERT Exemplar Solutions for CBSE Class 12 Physics are available here. With this article, you will get solutions from question number 5.16 to question number 5.20. Solutions of multiple choice questions with single correct answer (MCQ I), multiple choice questions with multiple correct answer (MCQ II) and very short answer type questions (VSA) are already available. Solutions of long answer type questions of this chapter will be available in other part. 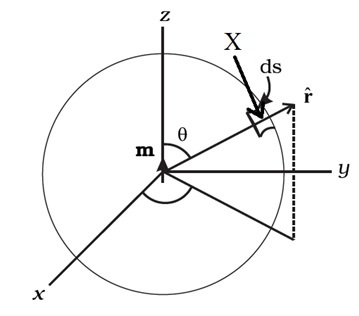 Question 16: Verify the Gauss's Law for magnetic field of a point dipole of dipole moment m at the origin for the surface which is a sphere of radius R.
Question 17: Three identical bar magnets are rivetted together at centre in the same plane as shown in Fig. 5.1. This system is placed at rest in a slowly varying magnetic field. It is found that the system of magnets does not show any motion. 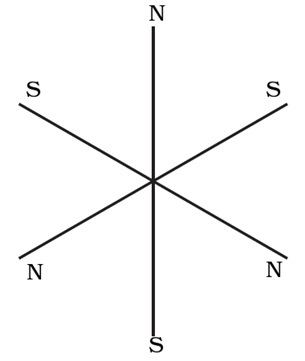 The north-south poles of one magnet is shown in the figure. 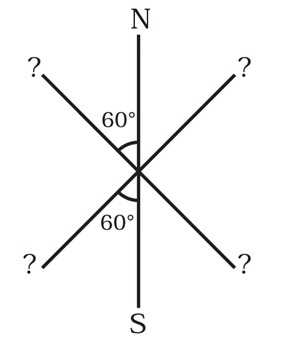 Determine the poles of the remaining two. 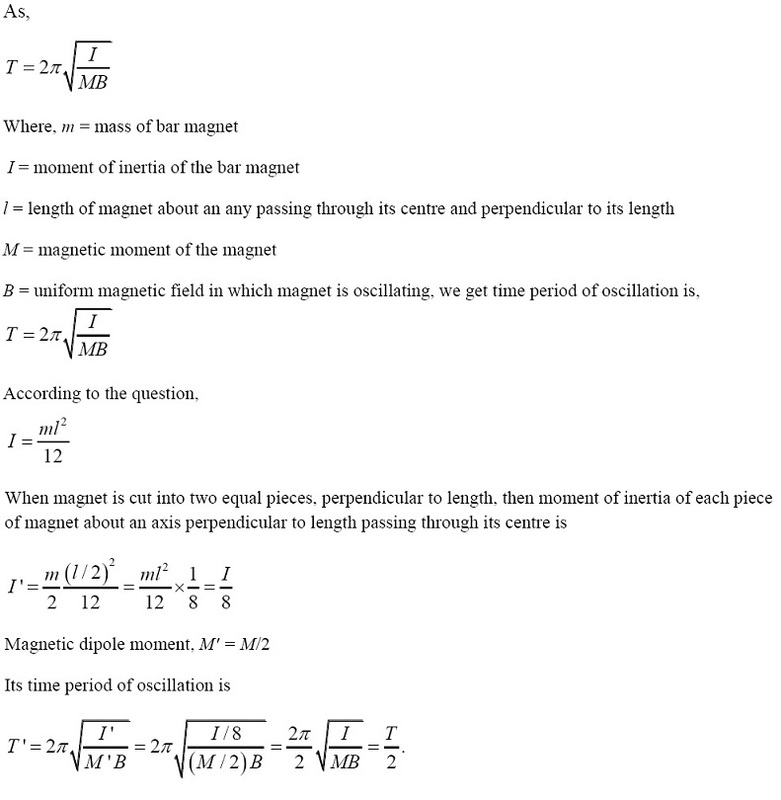 Question 18: Suppose we want to verify the analogy between electrostatic and magnetostatic by an explicit experiment. 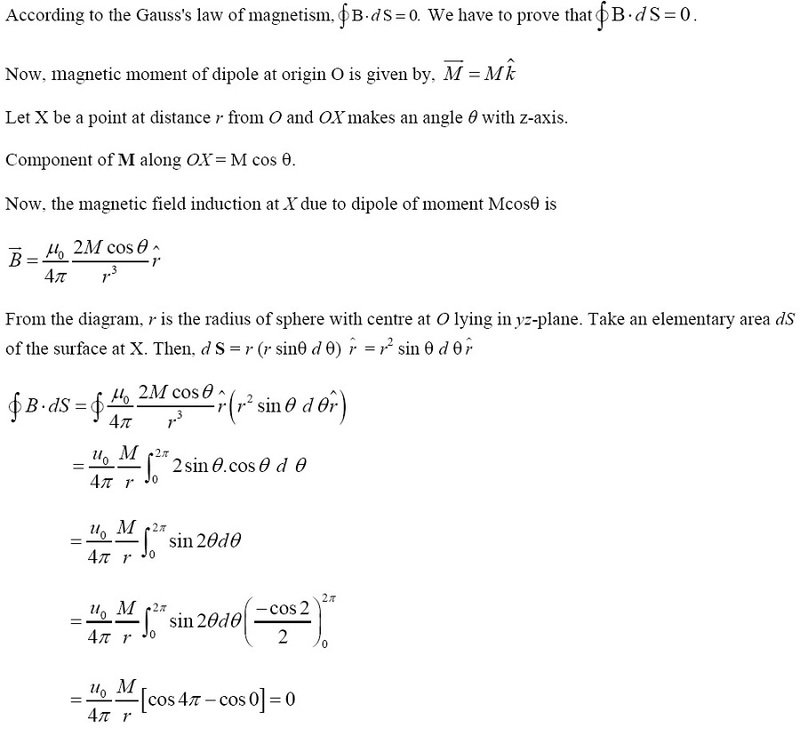 Consider the motion of (i) electric dipole p in an electrostatic field E and (ii) magnetic dipole M in a magnetic field B. Write down a set of conditions on E, B, p, M so that the two motions are verified to be identical. (Assume identical initial conditions). Suppose that the angle between M and B is q. Putting this value in Eq, (i). Question 19: A bar magnet of magnetic moment M and moment of inertia I (about centre, perpendicular to length) is cut into two equal pieces, perpendicular to length. Let T be the period of oscillations of the original magnet about an axis through the mid-point, perpendicular to length, in a magnetic field B. What would be the similar period T’ for each piece? Question 20: Use (i) the Ampere's law for H and (ii) continuity of lines of B, to conclude that inside a bar magnet, (a) lines of H run from the N-pole to S- pole, while (b) lines of B must run from the S-pole to N-pole.